Well, hindsight is a great perspective and sovereignty is a slippery devil. When Chinese ships are parked in Philippine territory, you know that sovereignty has been damaged in a real way. 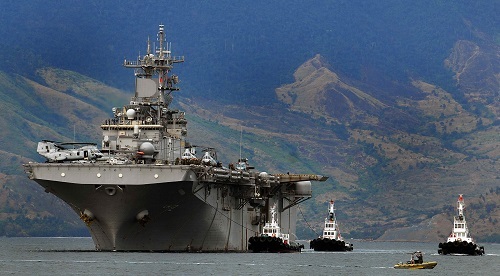 Had American ships still been in Subic, perhaps this might not have happened. The impassioned debate in the Philippine Senate in 1991 may have sacrificed Philippine sovereignty rather than preserved it. But the goal here is not to judge in hindsight, because that is always too easy and a lot unfair, but to look at where we are now. There is no question that sovereignty is the fundamental platform for independence. It is crucially important. Is the Philippines really caught between two separate threats to its sovereignty? America and China? America may be thuggish in her own way, big and rich and interested in using the Philippines to advance American interests. But America LEFT when ordered to go in 1991. China will not leave. Ever. You can quote me on that. American bases have nothing at all to do with occupation. And colonialism is irrelevant ancient history . . . except as ghosts are relevant. “Occupation and colonialism” are superstitions more than anything. Hobgoblins. Or political scare stories. Chinese ships parked on Philippine rocks in 2014 are real. Factual occupation. Today. Now. Uninvited. Who really determines Philippine sovereignty? China, America or the Philippines? It seems to me that Philippine sovereignty is determined by the capacity and will of the Philippines to manage her own affairs. With America, the Philippines is an equal partner. America respects democratic processes even if they go against American desires or interests. With China, the Philippines is not an equal partner. The Philippines is not respected by Chinese leaders. Is not listened to. Is insulted regularly. Is instructed how to behave. Is not visited by top Chinese officials. To Chinese leaders, the Philippines is a nation of dark-skinned outlyers, a lesser people, who do nothing but stir up trouble. Where are natural ties the strongest? Where does the stronger natural attraction lie for Filipinos? To China, because of proximity, heritage and ongoing engagements? Or America, because of history, heritage and ongoing engagements? The table to the right tells a clear story. I did it for an earlier blog and it is pertinent to this one. The Philippines has a population of 100 million and 3.5 million people (of either American or Filipino citizenship) in the United States. It surprised me that China was not on the list. 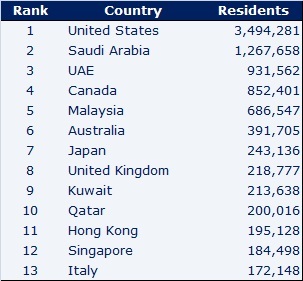 Oh, I found Hong Kong there, way down in 11th place, but no China. China was “off the charts”. China fell off the bottom. Based on records from the Philippine Department of Foreign Affairs, there were about 12,254 overseas Filipinos in mainland China. Most of them live in cities such as Beijing (2,492) . . . Guangzhou (4,564), Shanghai (4,264) and Xiamen (7,707). But . . . but . . . but I read that many of the Philippine’s top business owners are Chinese? And Chinese is strong within the ethnic mix of Filipinos going back centuries. Do the Chinese in the Philippines have contested loyalty? Flight 1898-1945: As American rule in the Philippines started, events in Mainland China starting from the Taiping Rebellion, Chinese Civil War, and Boxer Rebellion led to the fall of the Qing Dynasty, which led thousands of Chinese from Fujian province in China to migrate en masse to the Philippines to avoid poverty, worsening famine, and political persecution. This group eventually formed the bulk of the current population of unmixed Chinese Filipinos. Unity in fighting the Japanese: The new-found unity between the ethnic Chinese migrants and the indigenous Filipinos against a common enemy – the Japanese, served as a catalyst in the formation of a Chinese Filipino identity who started to regard the Philippines as their home. Integration: Marcos ordered a revision of all existing nationality laws which led to an easier acquiescence of Philippine citizenship, which most Chinese Filipinos took advantage of. This signified a major leap for the community, majority of which now owes loyalty to Manila, rather than toTaipei or Beijing. . . . Virtually all Chinese schools were ordered closed or else to limit the time alloted for Chinese language, history, and culture subjects from 4 hours to 2 hours, and instead devote them to the study of Filipino languages and culture.. . . Marcos’ policies eventually led to the formal assimilation of the Chinese Filipinos into mainstream Filipino society. The Chinese here are Chinese by ethnicity, not by allegiance. They are here by choice. They are Filipino. There is nothing for them in China except for a few business opportunities. No warm Chinese welcoming committee, no jobs, no ability to prosper, free. Some relatives undoubtedly. But, all in all, there are few material ties. How different for America where Filipinos live and visit and try to get scarce visas from the American Embassy, 1,500 applicants a day. One thousand five hundred applications per DAY. This is a threat to sovereignty? People looking for the good life, a place to visit, an education, a job, an opportunity to grow. It looks like a lot of Filipino citizens don’t feel at all threatened by America. It is peculiar that Americans, who occupied the nation for so long, did not become a significant part of the population. There was no American elite left behind, no American business dominance, no large American population, no integration. What was left behind were way too many abandoned kids, a second language – the global language of commerce – and an idea about schools across the land. To understand why America did not “move in”, one must go back to the history books to see what America’s engagement here was about. America was here to keep other nations from acquiring the Philippines. And American politicians argued amongst themselves for half a century. Can Filipinos govern themselves, or not? When the debate ended and the decision was made that, yes they can, America let go, granting the Philippines her independence. In 1991, the Senate missed that fundamental point. Can Filipinos manage and preserve their own independence? It is wise not to miss that point today. Who would be in charge if the Philippines tied in with China or America? Tie in with America for military strength and commercial gain. Tie in with China for military strength and commercial gain. Play the bigs off against one another; squeeze them both. Doesn’t just thinking of that third alternative give you pause? In case 1, sovereignty is clear . . . unless the Philippines is so weak that China takes over. In case 2, sovereignty is clear and security is enhanced. The U.S. does only what the Philippines agrees to do. In case 3, Philippine sovereignty would be a lot like Hong Kong sovereignty. Controlled. In case 4, Philippine sovereignty would remain whole, but there would be no clear path to security and prosperity. It is important to understand that the United States is NOT imperialistic. She DOES act in her own best interests. And it is in America’s interest for the Philippines to be free, democratic, independent and totally sovereign. And secure. As for China . . . write your own conclusion. I know there are certain vocal people in the Philippines who still raise the “imperialism, colonialism, occupation” hobgoblins, sometimes stomping about on Roxas Boulevard in front of the American Embassy. They are still missing the fundamental point of exactly WHAT America’s interests are. And they object, not on behalf of the Philippines . . . but to advance their own private interests. The Philippines would prosper if the prickly insecurity raised in 1991 were set aside. For that is what it was . . . and remains, today. The Senate’s 1991 eviction of American military forces represented an essential failure to understand America’s interests combined with a failure to believe in the Philippines. This remains a problem if Filipinos continue to believe that America is interested in anything but Filipino independence, security and autonomy, or if Filipinos believe Filipinos cannot control Filipino interests in dealing with the U.S.
That is, if the Philippines answers the century old American question, can Filipinos govern themselves – including forthright management of alliances – with an astounding . . . Considering the brutality of Americas’s deeds in the Philippine American War, and considering the destruction that occurred in Manila during World War II at the hands of American military bombardment, it is understandable that there would be lingering reservations about tying in with America. But it is a very different era. Japan is an ally. China is working itself up to be an enemy. Old thinking penalizes the Philippines. a strong, healthy . . . sovereign . . . Philippines. And it is important that Filipinos consider the CORRECT answer to the century old American question, can Filipinos govern themselves? The answer to the question/title of this installment is as shooting fish in a barrel – YES! This is a most important hindsight template for ANY Filipino (most especially would-be leaders worth their patriotism!) to answer or reflect on again and again. Seems easy to me, but I recognize I have certain biases. Yet there are some things that seem to be overlooked here. Like exactly WHAT America’s interest is (it is not oil and minerals, it is holding ground . . . or seas . . . or power). And the Philippines is already deeply invested in the United States, not the other way around. Fortunately there were opposing voices to Roosevelt that eventually brought America to her senses. A couple of years ago, I did an inquiry of that period centered around Admiral Dewey. He dealt with Aguinaldo face to face and the central political issue of the time was the question I posed, can Filipinos manage for themselves. It was interesting to see an apolitical general have his mind changed by the political realities he had to face when he returned home. His answer to the question essentially changed from “yes” to “no”, perhaps to line up better with McKinley and Roosevelt. I was greatly disappointed by what my probe into history revealed. Which is why I now stick with polemics. 🙂 I’ll have to see if I can find that piece and get it into the library tab. Jerry West was “da man” among great pretenders. I was in Los Angeles at the time, and traveled many times to the old arena, the Los Angeles Forum, to watch those Lakers shine. Once I had seats right under one of the backboards where you could hear the “oofs and grunts” as Wilt Chamberlain shed bodies as easily as you and I flick ants from the shirt. Well, me, anyhow. There are ants everywhere here. In the grand scheme of things, I don’t think America’s commitment to the Philippines is should be depended on. For America, the closing of Clark and Subic may have been a blessing, which is why there was really not that much American angst over closing the bases. When America lost the bases it also lost the necessity of defending them, or the host country — one less responsibility. That’s why the Korean and the Japanese governments are more or less delighted to host American military bases. I’ll bet America would be delighted if the Koreans were to kick us out, but it’s not going to happen, no matter how many student protests against the bases there are in Korea. I think you are absolutely right about the Koreans and Japanese, the occasional bad American behavior and popular uproar not withstanding. The Philippines shot itself in two feet in 1991. One, the sovereignty foot, although that was an accident, for China’s belligerence could not have been anticipated back then. The other, economically and developmentally. That was a choice, a sacrifice, a payment for the perception of sovereignty. I also think America’s interest in the Philippines shifted with President Obama’s pivot to Asia. What was a “ho hum” eviction in 1991 is now an open willingness to “invest” in the Philippines for storm relief, more training, more troops stationed here. It is win win for both the Philippines and U.S. it seems to me. First thing, Americans will not Leave Subic bay even there was disagreement between Philippine and US government that period. America will raise the pay if required, however they found it as waste of money and time. American military are not just military generals but scientist and geologist were employed by American military for their Asian vision. Some of my friend living near Olongapo and Angeles often saw F16 arising from a mountain, they suspected, there were Jet fighters hidden underneath those mountains around 70’s. Scientist and geologist knew Pinatubo will erupt, so before that, most of the expensive Jets and other military equipment were ship-ted to Diego Garcia or Japan. If these natural PHENOMENOM wasn’t there, American will not leave. Some suspicion among local inhabitants, American may have mined gold, copper and platinum and other minerals along these mountains nearby Pinatubo. Suspicion died as the time went by. American and Philippine vision for liberty were like partners with deep involvement from the past, hence these two become again a union of force for freedom, practicing somewhere in one of the islands. Actual game in warfare is a must even with high tech weapons to see and experience the relainty of war. The only way American can do it with safety in front is with Filipinos whom can communicate very well in English. If Americans will practice in Japan or Indonesia, miscommunication may mis-fire a weapon and kill a soldier . Even the Chinese started parking illegally and war may erupt, US military will not allow 3rd day of Chinese Attack. Day 1, US will provide order to Chinese to leave from Philippine territiry, Day 2 US will provide warning shot, Day 3, US will attack. How did I formulate this? First, US hates communist, if possible, all nations shall have democracy as the leading principle in life, however, greed rules for every leader of Nation, only few such as the Philippine embraced the democratic form of government, somehow greed and good leader battles each other to maintain freedom, whoever was stated, US is happy, at least Philippine is practicing democracy. 2nd and last formula: A third world war is dangerously swift, if China may attack with Nuclear weapons, too many people will die. Americans will not hesitate to use their secret weapon perhaps laser guns from satellite targeting Nukes in China or the conventional undetected jet bombers equipped with guided missiles. A most fascinating read, Mac, and I have both agreements and disagreements. One agreement is the grinding of freedom for people versus greed of the established order. It is more formalized in the US through political parties, Democrats (people) and Republicans (moneyed people). Here all political parties are tied to money. So the peoples’ voice arises from the streets. I lived in Zambales for a time (my son was born at the Gordon Hospital in Olongapo). It is not a huge distance from the coastal cities to Pinatubo so I think hiding jets, and a long runway, there would be difficult. I am also unaware of the U.S. military ever crossing over directly into commercial activities such as mining. So I’d put some of those ideas into the category of good imagination. Times today are very different than in 1991. As I mentioned to Sonny, the U.S. pivot to Asia raised the importance of the Philippines to American “interests”. If ever there were two nations with the SAME interests, it is the Philippines and America. So to me, a stronger American role here is a no-brainer. But there are still the old-school patriots – Senator Santiago among them – who bristle at the notion of foreigners on Philippine soil. It is just odd that they don’t see how fond Filipinos are of America, and they have no solution to China’s huge military presence parked a cannon shot from Zambales. May I add my say. Our family was one of those in favor of the Americans leaving their bases. However, we were also one of those who thought at that time that the timing was not right. The local economy was in shambles and we were struggling to put our reacquired democracy back on its feet. Also, the arguments that the no-more-bases proponents have were, as we perceived them to be, emotional. The economic impact was never thoroughly discussed out there and in its place were romantic words – total sovereignty; total independence. Indeed. So the family, some of my sisters and us, packed up and left for abroad. We all decided to maybe come back when things settle down. Things never did settle down. Corruption persisted and the gap between the rich and the poor widened. The elite did their “economy tango” with the multinationals (the new colonialists) all at the expense of the marginalized. And the maoists remained active in the countryside. The country was step away from being South East Asia’s basket case. There were times that it felt it was already there. Were it not for the much neglected OFWs and people like us who would remit foreign currency to our relatives in the Philippines, there’d be no foreign receipts to keep the country afloat. The time has come to re-study our relationship with our genuine allies from the economic and security stand point. It does not mean just the United States but the ASEAN region and beyond. The country is now facing a different reality from that which obtained in the 90s, the world wide web being one of them. Total independence and total sovereignty need not go down the drain in the process. They just have to be tempered with what is practical and workeable for the ordinary Filipino. Wonderful piece yourself, Vernon. I appreciate the personal background, which sounds to me like you made a bold but wise choice back then. I actually think Mr. Aquino is going down the path you suggest, to build relationships across ASEAN. The current question is, will the Supreme Court let him act? The decision to eject/evict American bases was the handiwork of deeply “patriotic’ citizens of a country who wanted to assert its sovereignty. But I still have to see sovereignty in its full meaning because I could never accept the fact that the name alone of this country denotes that it is not independent yet from the mother country whose umbilical cord is very much connected to the institutions set up by those who came and claimed it as their own and had the gall and temerity to sell it when an interested buyer came in. Those ‘patriots’ did not have any common or horse sense that times are changing and changing fast for those who are looking beyond their immediate surroundings since that beyond looks ripe for the picking and Big Brother who used to be the guardian is no longer around to protect it, not unlike those times that they were not yet ready to gobble up small, nay, wee, clusters of islands and rocks. We are on the path of a bully who seem to think that they could do anything they want because the ‘patriots’ of this country did not have any foresight whatsoever to think that military preparedness should have been given top priority since this country stood naked from external aggression with the departure of Big Brother instead of their political posturings and corrupt ways to enrich themselves. Very strong reading, gerverg. You said strongly what I said softly, that Philippine sovereignty is in Philippine hands. The historical cords of structure indeed exist in the Philippines, to America, but the current decision-making has precious little to do with America. If the structure has been resold, it is to oligarchs and crooks and emotionalists and vested interests, within the Philippines. And you are right, China goes for weakness like a lion on a puppy. There is more than one America. One is the political entity with a Secretary of State and diplomatic concerns. One is the capitalistic, sometimes monopolistic concentration of financial and other multinationals. One is the melting pot of 10e generation puritans or 10e generation African Americans, the legal or illegal immigrants from every imaginable country in the world and everything in between. One is the American dream of freedom and democracy. For me it would be an easy yes to the American people with their ability to generate a common culture, yes to the American dream. But I’m not so sure about the undemocratic decisions of many multinationals. I’m not so sure about the influence and the lobbying of these multinationals in the political world. Will the Secretary of State defend the American people or the American economic might? Has the Philippines enough economic value compared to China? Will the Americans ignore their largest financier and choose for “principals”? Do the Americans realize that at current growth rates they will be number two by the year 2050? For me at this time, the best bet seems to be internal strength enhanced by regional strength in ASEAN and in partnerships with Korea and Japan. What you are pleading for as nation building, the “we” feeling, “we Filipinos can do it on our own”. If this requires kicking big brother’s legs, so be it, the US can survive this. I don’t have a problem with your “best bet” with regional allies, I just have a problem with the pragmatics of getting there. China is getting yet bolder, patrolling and surveying just off the coast of the Philippines. That not one nation joined the Philippines in the ITLOS filing speaks loudly as to the difficulty of going that route. America can be here next week. And gone when they are no longer needed. All in life is complex, regarding military industrial complexes and political vagaries and the lingering taint of history. But this is all pretty simple to me. If the Philippines is indeed a sovereign nation, there is no need to fear America. Just tell her what to do and if there is willingness, great. If not, don’t do anything. The U.S. pretty much caved to all the Philippine demands during the previous meetings. Good for the Philippines. I don’t think the USA has any lingering interests in the Phil. there is nothing here in the Phil which could be of interest to her. After she left the bases she just moved on to other things, specially with all the problems plaguing her domestically. The PROC and the USA….are two opposing faces of the same coin, good thing the Phil. got rid of those bases and in due time we will find a way to counter the threat of the PROC. As for the US respecting Phil. sovereignty, appearances can be deceiving; if they can violate German sovereignty by bugging Merkel chances are they are doing the same thing to the Phil….. Your view is shared by many. Not by me, but, hey . . . the sun came up anyway. “China will not leave. Ever. You can quote me on that”. Your cote is based on presumptions. China is claiming land, and is always described as provocative, etc. My god, compare to the activities of the Western powers in the last 200 years to the present, China is almost angelic. China has never gone around exporting communism or their social values. Can’t say the same for the US ramming democracy down everyone’s throats, and leaving behind a smoldering mess of a former country. China never messes in other nation’s affairs. So what is the US doing sticking its nose into the South China Sea? Yes read good Filipinos, it’s called South China Sea. The Philippine parliament passed a law calling it the “West Philippines Sea. If these sea truly belongs to you, why you still feel urgency to pass new law to rename the sea? Rename the sea to make it as yours ? “China will not fire the first shot but will not allow others to fire the second shot.” This is the Chinese philosophy, get use to it. Good of you to visit and comment, AV. Let me respond on several points. It is important to look at any confrontation in its proper time and context. For sure, Western nations have waged a lot of war, and China benefited from this at the end of WW II. But those issues have no bearing on the conflict now occurring in the South China Sea, and diverting the issue ot culpability of Western states is just that. A diversionary argument that is not to the point. China’s acts – in the eyes of Filipinos and Vietnamese – are hardly angelic. Indeed, Western and Eastern values differ. The US does seek democratic institutions because they, in an idealized and some places actual state, best give people a voice in their own well-being. Dictatorships take a different approach, and have either good or bad result depending on the circumstance. There is no proven “right way”, but giving people a voice, as in human rights, is admirable. China is occupying rocks that are clearly within the UN defined exclusive economic zone of the Philippines. China argues for bilateral solutions to work these disagreements out, and then refuses to participate in the only official bilateral forum, ITLOS arbitration. The US is defending right of free passage through and free flight over the South China Sea for commerce and decries the militarization of this zone, for it is unnecessarily destabilizing. She is also willing to defend her friends who are faced off against an apparently acquisitive neighbor. The seas within the Philippine Exclusive Economic Zone are referred to in the Philippines as the West Philippine Sea. The Philippines calls the seas outside her own territory the South China Sea. China’s evident unwillingness to let the Philippines call her waters whatever she likes is indicative of the failure of China to even attempt to understand her neighbor’s prerogatives. “Get used to it” That is exactly the tenor of belligerence that flows forth from China and her apologists. Let me quote “That not one nation joined the Philippines in the ITLOS filing speaks loudly”. Yes, that one country doesn’t play it smart like other ASEAN countries. With the exception of Philippines, most ASEAN members have friendly a win-win economic relations with China. Even Vietnam and China are working on reconciliation. If the Philippines does not take side in geopolitics and stays neutral like most ASEAN countries, China is likely to soften its stance against the Philippines for a win-win outcome. After all, China is the largest trading partner of ASEAN. But this would not be in the favour and interest of the US, isn’t it Joe ? as it will enlighten you and get all used that they will change the world. Yes, of course China will change the world, and she can choose to do it in harmony with and respect of other nations, or try to impose her will. The latter approach is so unnecessary in an enlightened world, I think. This causes me also to think of all the Chinese who live in America and have found the US to be no threat to their well-being, but, rather, protective of it. “The US is defending right of free passage through and free flight over the South China Sea for commerce and decries the militarization of this zone, for it is unnecessarily destabilizing”. Like the US, the Philippines support the freedom of navigation and the law of sea (oh, the US have never signed to the law of sea). If this is not hypocrisy, what else then? Do you think China will listen to someone that even didn’t signed the law ? And did China ever block any free passage ? Are this again no presumptions ? I also could presume that the US will block the free passage for China once they are attributed to the Philippines. Is this the game of the US ? I don’t represent the US and only observe what is going on and try to reconcile it with what I experience while living in the Philippines. I think China listens only to what pleases her. And again, this challenging attitude in your remarks is so unnecessarily confrontational. Rather the same attitude that China projects to other nations. I don’t think you really WANT to hear my points. Just object to them. “China’s acts – in the eyes of Filipinos and Vietnamese – are hardly angelic”. Yes, internet age can stir up things easily. Imagine a scenario in 19th century, A black guy was just lynched on a high tree in America, everybody online can see and watch what’s going on with those whitey boys violating human rights which they claim they have. The whole world will go nuts, isn’t it Joe. Racial provocation is unnecessary and I’m afraid I don’t understand the point. This is 2014 and America has a black president. People on line are both responsible and irresponsible, just as they are in person. “Racial provocation is unnecessary and I’m afraid I don’t understand the point”. Has nothing to do with racial provocation but the internet stirring up things. I would call this a statement Joe. I even could call it adding some more oil on the fire. I’d be happy if China would prove me wrong and leave Philippine waters. Your statement shows that you aren’t just an observer. Is fine, i have no problems with that and accept your personal opinion however in that case you aren’t just an observer in the conflict between China and the Philippines. Having read this it looks like granted for you that China will invade the Philippines. No, I don’t foresee invasion but theft of resources including protected species that rightfully belong to the Philippines. I don’t see the necessity of confrontation when there could be joint exploration and China could simply buy the products that are extracted from Philippine seas. Save the cost of aircraft carriers maybe. Keep commercial exchange between the two nations robust. Eliminate the need for the U.S. to have a physical outpost here. So, given that China’s approach makes no sense to me, I can’t predict what she will do. Further, to the point you raised early on, it does not take firing the first shot to be an act that provokes confrontation. If China were to set up an oil rig in Philippine waters, that could be considered as offensive as firing weapons. It would be a threat to Philippine sovereignty and the nation’s ability to care for her people, calling for action of some kind to repel the offense. In the US, if a burglar creeps into my home at night and I feel personally threatened, I can legally use deadly force to stop that threat. A parallel response can occur when a nation’s sovereignty is threatened. This business of confrontation is very dangerous. “I can’t predict what she will do”, is just the problem. You can’t. Do you really understand them ? Or do you want they act or do what your believes are ? “If China were to set up an oil rig in Philippine waters”, Joe, you assume already they are from the Philippines. And please keep in mind, they will NEVER give up. “the nation’s ability to care for her people”, are you serious ? Do the representatives from the nation cares about their people now in the Philippines ? I can understand you, so how do you think the Chinese feel if the US creeps around their home ? They also feel threatened. Never thought on that one ? Starting at the last point and moving up. The US was slipping out of Asia, militarily, until China started being acquisitive. So if China feels threatened by the nation that defeated Japan in part on their behalf, I’d say China does not really embrace friendship as anything more than a convenience. I believe there are a lot of Philippine leaders who care greatly for the nation, and a whole lot who care mainly for themselves. China will never “give up.” The question is why in the world they frame it as a contest, when it does not have to be one. My orientation is the Philippines because that is where I live. I don’t understand the logic of China being forcefully acquisitive in a small world with lots of overlapping interests, or her failing to respect UN principles aimed at resolving disputes of this kind. We agree that I can’t predict China’s acts. It is good to find that one point of agreement. Instead of keeping spreading anti-China propaganda, America should had submitted The Treaty of Paris of 1898, The Cession Treaty of 1900 and The Boundaries Treaty of 1930 to Hague Tribunal for review because Filipinos could not understood Americans written Philippine constitutions ! You are to quick in assuming that the catch is already in the pocket for the Philippines. Hindsight is a wonderful perspective.